Everyone agrees that Isabell Taylor isn’t missing. Except that she is. When down-on-his luck accountant Nick Rohmer is first approached to find her, he turns the job down. It’s not what he does. But the client has cash and he has bills, so despite the red flags, he accepts. His inept investigation leads him into the strange and dangerous world of ex-marine, sculptor, presumed gold digger, and possible wife-killer, Rennie Taylor. By the time Nick realizes he’s in over his head, there’s nowhere for him to go but forward, and no one to blame but himself. A cool November evening heats up when a 170 foot megayacht catches fire at the Fort Lauderdale boat show. Left behind are a multi-million dollar crime scene, a dead body, and a lot of questions. Detective Adria Hill was tired of dressing up for prostitu­tion stings, but complaining hadn’t gotten her any­where. Not until she was forced to make a politically embarrassing arrest did her superiors decide that maybe this was a good time for a change. 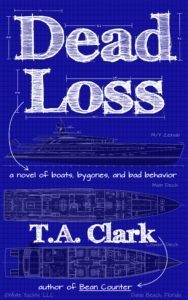 Freshly reassigned to Homicide, and over the objections of her new captain, she is put on the high-profile case of the boat show fire. With no experience and no support from her co-workers, she has to deal with a lack of evi­dence, a sick mother, and a suspended Sheriff’s deputy who is pursuing his own special revenge fantasy. She eventually finds an ally in Luc, a fraud investigator sent by the French insurance company. Together, they work to unravel the mystery of the fire, the murder, and Adria’s own enigmatic family history. What do you get when you mix two dead bodies, millions in missing money, and a dangerous idiot wearing a hammer he’s named Thor? The answer: murder, malfeasance, and mayhem. When the head of Nick Rohmer’s Miami accounting firm is found dead after a suspicious accident, Nick finds his quiet, comfortable, boring life slipping out of his control. With most of the firm’s management either on vacation, sick, or dead, Nick is thrust into the unfamiliar position of actually having some responsibility. The weight does not sit easily on his shoulders. He’s relieved when the instructions from the Chicago head office are – don’t do anything until we get there. This he can do. He tries to stick to his ‘do nothing’ instructions even as the firm’s largest client threatens to jump ship. But Nick’s plan of inaction is short-lived when he is convinced to try to save the business. He secures an invitation to dinner on the private island of the mega-wealthy, and highly dysfunctional, Keene family. Things quickly go from bad to disastrous when another dead body shows up, and Nick finds he’s the prime suspect. Sign up for my newsletter to receive notification of new releases and special offers. My Kindle Scout campaign is over! 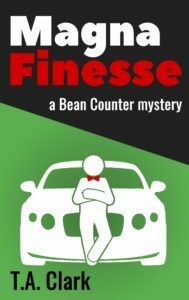 Magna Finesse is on Kindle Scout! 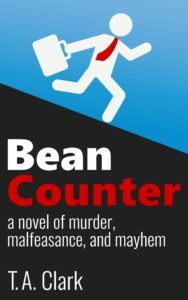 Bean Counter is once again only available on Amazon. Here’s why . . .
© 2019 T.A. Clark. Theme by XtremelySocial.